This web site contains a wide variety of media and text content including print, photos, videos, audio, various kinds of art, and more. Because this media came from a variety of sources, technical media professionals were hired to scan, review, evaluate, and make the necessary appropriate corrections to ensure consistent quality for the best web site posting. For photos, blemishes were removed and images were color-corrected as necessary. Archival articles dating as far back as 1958 were restored to a clearly readable condition using Photoshop, and then were saved in PDF or JPEG format. Also, a tremendous amount of effort was extended to track the authorship of web site content so that proper permission could be obtained. To view all web site content, be sure to click on the menu bar titles as well as all the title categories within each menu. Please send an email to project producer Kathy Turco, at kath@alaskas-spirit.com if you have any questions about the web site content. The photo to the right shows me next to George Attla in Huslia after the 2011 New Year’s sprint dog races. 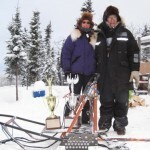 We are standing behind our first-place trophies on the winning sled. George, who is the project’s tradition bearer, won the 2-day men’s race and I won the 1-day shorter women’s race. At 78 years old, George made the win look easy; however, I am no racer. My fear of competition and nervous nature did not stop George from working with me to try to win the women’s race. With the good dogs of his kennel he said I could do it. In the few weeks he coached me, which seemed more about building my confidence than becoming a good dog driver, I learned to stay calm at the starting line, handle a racing sled, and allow his well-trained sled dogs to run their race. It was truly one great ride and win! I tell this story to illustrate what George wants viewers to learn most from the web site: that being a winner of a race and in life is a mind-set. One of my goals as the producer of this web-based project was to share a variety of media about George’s remarkable sled dog racing career, one that has spanned 7 decades, and include the rich history of sprint sled dog racing in Alaska. No one doubts George Attla’s tremendous knowledge about sled dogs or that he has given his absolute all to the dog racing sport he loves. Both are recorded by media professionals and amateurs who have captured George and his dogs in print, photos, video interviews, drawings, and more. The realized documentary effort is larger than this project alone, but my hope is that through this content, viewers of the web site can feel the long-standing historic buzz that George generated by his life-long determination to overcome adversity and give his absolute best in every race. To work in collaboration with George Attla has been a rare privilege. He has given to the project like he gives to the sport of sled dog racing. 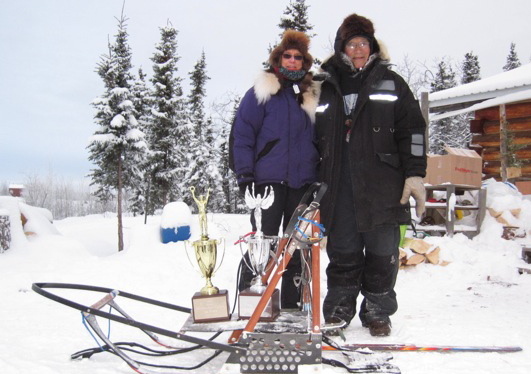 Today, George still raises, trains, and races sprint dogs to inspire mushers and to encourage both adults and youth to never give up their dreams. George says he has had a very fortunate life and never could have excelled in dog racing without the tremendous support of his immediate and extended family, and many friends along the way. With gratitude, he freely shares his knowledge about sled dogs, crediting the gifted dog trainers and mentors of his father’s time, with anyone who asks. I hope you enjoy attlamakingofachampion.com as much as I did producing it!